Gut Health - your digestive system plays an integral role in optimal health. A healthy gut microbiome positively affects nutrient absorption, hormone regulation, immune function, emotional health, and several other important aspects of your health. We use advanced diagnostic testing, food as medicine, and precise supplemental dosing to get your gut in ideal working order. Detox - detoxification is the process of removing toxins or toxic materials from your body. We implement strategies to help improve your body’s capacity to detoxify harmful substances and work with you directly to help prevent unnecessary toxin exposure in your home, car, and workspace. Immune Support - The immune system, which is made up of special cells, proteins, tissues, and organs, defends people against germs and microorganisms every day. Sometimes the immune system is either over active (autoimmune) or under active (infections). We work diligently to regulate and support the immune system using detailed assessments and multi faceted approach. Hormone Balancing - when there is too much or too little hormones available, then hormone imbalance occurs. And since hormones affect our brain, bones, heart, and reproductive organs, they are essential to every cell in our body. 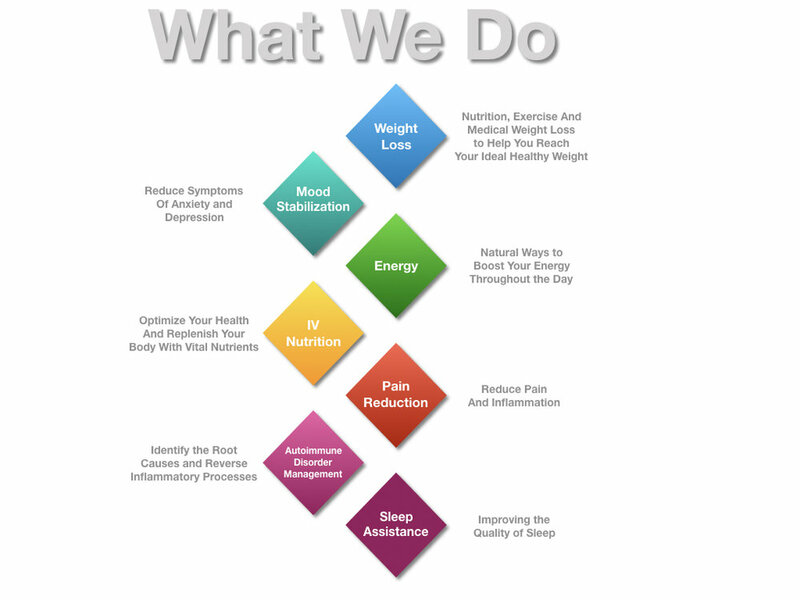 Our hormone balancing strategies uses all natural substances. We will work directly with you to create the best plan to relieve your current symptoms and help you live the lifestyle you desire. Genetic Testing - Genetic testing can reveal changes in your genes that may cause illness or disease. These mutations can hinder your progress toward weight loss, increased energy, mood regulation, and mental clarity. 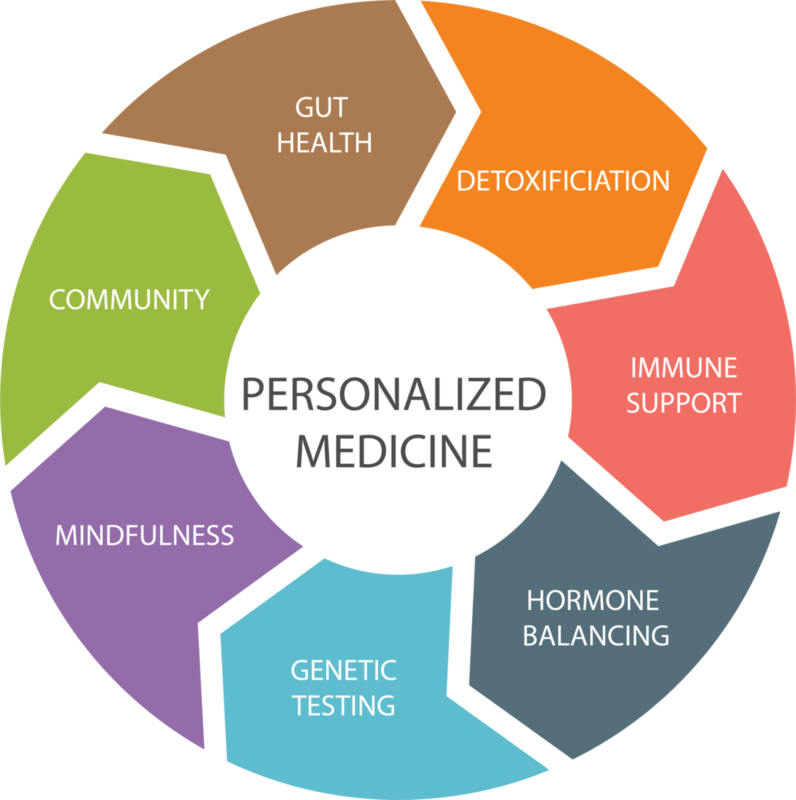 We use the best genetic testing available to personalized your healthcare plan and help you reach your goal. Mindfulness - Benefits of mindfulness include stress reduction, performance enhancement, awareness through observing our own mind, and increases our attention to others’ well-being. Mindfulness is innate, but often needs to be cultivated through proven techniques. We give you resources to make daily mindfulness easy.